The shy Grass Snake is an attractive reptile which is found throughout europe. It is now less common in Britain than it was. It favours damp areas around streams, ponds and woodlands. Because of this it was once known as the water snake. Grass Snakes are not poisonous but if provoked will sometimes engage in mock attacks, rearing up, hissing and making striking motions. This is designed to intimidate so that the snake can escape. In contrast, when disturbed Grass Snakes sometimes pretend to be dead and lie perfectly still, often with their mouths open. Their last method of defence is the excretion of a foul smelling substance, they do this particularly if handled. The adults prey on small animals such as frogs and will also enter water to catch tadpoles, newts and even small fish. It is no surprise therefore to discover they are good swimmers. However they are also good climbers and can even take young birds. Their diet can incude lizards, slowworms, mice, voles and even shrews. Young Grass Snakes feed on slugs and earthworms as well as tadpoles. 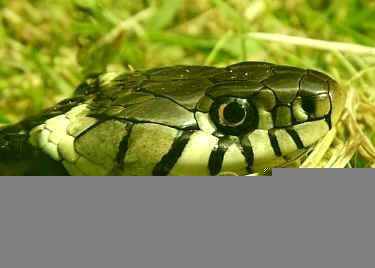 Grass Snake hibernate over the winter and mating takes place soon after they emerge in the spring during April or May. Sometime in June or July the female lays about 30 eggs in rotting vegetation. The heat generated helps to incubate the oval, one inch long eggs. The 7 inch long youngsters hatch after about 2 months and are immediately independent. The females usually reproduce only every other year. They are minature replicas of the adults with slim olive brown bodies complete with the distinctive yellow band behind the head which so readily identifies the Grass Snake. They will usually grow to be about 3 feet long (1 metre) although individuals are sometimes found which are over 5 feet (140 cm). In common with other reptiles, Grass Snakes like to bask in the sun. They do this to raise their body temperature because unlike mammals they are cold blooded. That is, they are unable to control their body temperature. They will often bask with other Grass Snakes or even Adders. Grass Snakes "taste" the air with their tongues.